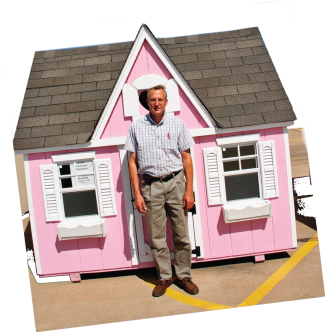 In an average year, the company produces 20 gazebos, sells about 25 playhouses and completes over 100 storage sheds. “For the gazebos and storage sheds, I have a standard model, but the buyer can customize it how they want. On the cabins, we have a base price, but they can lay it out how they’d like,” said Martin. “And with the cabins we can build them on site. The largest we’ve built was about 600 square feet. Martin can be found on site in Sherman Fridays 1-5pm; Saturdays 10am- 3pm and by appointment. Dorothy Hayes’ home is a one-woman doll factory. Hayes shares her house with grandchildren, great-grandchildren and at least 250 dolls.